In response to a recent blog about jobs (see below), Alan Maynard, the dean of UK health economists, asks whether the loss of health care jobs is a manifestation of expenditure control or efficiency. Here’s my answer. If hospitals and physician offices were bloated with employees, this decline in employment could simply be a move toward greater efficiency. But rare is the health care worker who is not stressed already. No, this is expenditure control or, more properly, it is cutting back on the payroll in response to relentless cuts in Medicare reimbursement, both directly and in the form of penalties for the failure to meet various quality and readmission standards now and in the future as the ACA is implemented. These job losses must be viewed in the context of what’s been happening to jobs over the past several decades. The US has currently has about 1,225 fewer jobs per 100,000 of population than it did in 1990 – almost 3% less. The big losers have been manufacturing, mining and construction, which lost almost 4,000 jobs/100,000. Local governments and most services underwent little change, but together with retail, both federal and state governments and some other sectors, another 1,500 jobs/100,000 were lost. Even information technology lost jobs, as the internet gained but newspapers shrunk. What made up for this deficit of 5,500 jobs/100,000? Only four sectors did. Together they added 4,300 jobs/100,000. Education accounted for 8%, leisure and hospitality 17%, professional and business services 35% and health care 40%. Yes, about 1/3 of the jobs deficit that resulted from a contraction of manufacturing and other slow or no-growth sectors was made up for by additional health care jobs. but this is threatened. Meanwhile, there are enormous unmet health care needs, especially among the poor. The problem is, of course, that health care, more than other sectors of the economy, requires cross subsidies from the rich to the poor. But the poor have been subsidizing the rich most of these past 35 years, so a change in direction might not be unwarranted. And a bit more investment in social infrastructure would be good, too. Together, these investments in health and social services would fuel the economy, employ the populace, enable healthier lives and strengthen our democracy. But it can’t be done without physicians. Doctors are not everything in health care — there are only about 225 practicing physicians per 100,000. But they are the lynchpins of the health care system. Or we could continue to cut health care spending, constrain the growth of physician supply and allow the nation’s major jobs engine to sputter. But why? Four years ago, as ObamaCare was being debated, and as action on expanding physician supply languished (as is still the case), I wrote on this blog, “More Jobs, But Not Without More Physicians.” Over the previous decade, with the boom of the housing bubble and the recession that followed, the US had added only 6 million jobs, and half of those jobs were in health care. This engine of health care jobs continued in the years after 2009 at about 30,000 new jobs per month, but since the beginning of 2013, it has slowed. Since May, health care jobs have grown at only 2/3 the previous rate, and the number of jobs in physicians’ offices has declined from a previous average of 4,000 monthly to zero. In fact, last month there was a small loss of jobs in physicians’ offices. Physicians are being squeezed, and its effect is rippling through the job market. 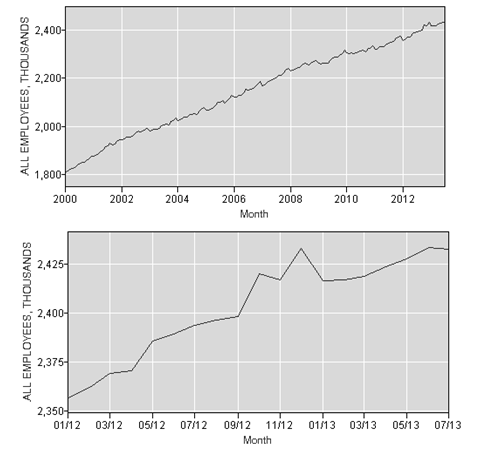 The top figure shows the long-term trend of jobs in physicians’ offices from 2000 to today. Below it is a graph of the past 18 months, from Jan 2012 to today. The nation’s greatest engine of jobs is sputtering. Res ipsa loquitur! The IOM’s new report on geographic variation in health care was released yesterday. It attempted to define the reasons for the variation that has been projected by the Dartmouth Atlas and has fed the frenzied war on waste. The IOM’s approach was similar to Dartmouth’s but differed in important ways. Both measured Medicare spending that had been aggregated at the level of HRRs and both adjusted it for age and gender (which don’t vary) and black race, which does but is a poor proxy for the broad group of socioeconomic factors that matter. That left a lot unexplained by Dartmouth. But the IOM committee further adjusted for input prices, which markedly decreased variation, and it also looked at variation in commercial insurance costs. Among Medicare beneficiaries, almost half of the variation between the top and bottom deciles was explained by health status, 9% by race and 6% by income. Due to co-variances, the three together explained 43%. These factors also explained 10-20% of the variation for commercial insurance. That left about 65% of the variation in total health care spending unexplained. Of this, about one-fourth was attributable to variation in acute care (including procedures, diagnostic tests, prescriptions and ER visits), while three-fourths was attributable to post-acute care. The fact that there was greater variation among HSAs than HRRs drew the IOM committee to recognize that there was a great deal of internal variation and that adjusting payments based on aggregate measures of geographic differences in HRRs would unfairly reward “low-value providers in high-value regions” and punish “high-value providers in low-value regions.” Therefore, it encouraged Congress not to adopt a geographically based value index for Medicare. But despite the fact that, as mentioned, most of the variation was in the post-acute sector, the Committee’s major conclusion was that CMS should test payment reforms that incentivize health care systems to assume some or all of the risk of managing health care. Indeed, this conclusion was incorporated into the title of its report (“Target Decision Making, Not Geography”). No study was necessary to reach that conclusion. Indeed, nothing in the report suggests that payment reform would be necessary. Very little of the variation had anything to do with acute-care, and little credence was given to any of the variation. It could not have been more clearly stated. As I said in the Washington Post on September 11, 2009, the Dartmouth Atlas is the wrong map for health care reform. 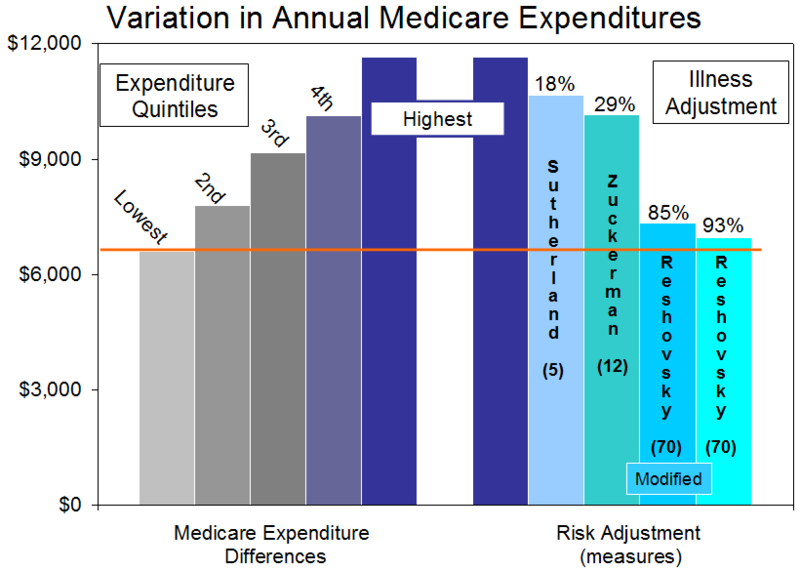 Had the Committee pursued the lead that variation increases as the unit of analysis shrinks from 300 HRRs to 3,000 HSAs, they might have done what my colleagues and I did, which was to move even lower to the level of the 30,000 ZIP codes, where virtually all of the variation in acute care is due to variation in income, education and the burden of disease. So what the report really found, but did not say, was that poverty and its associated poor health status is the major cause of geographic variation in health care and its effect is far greater than apparent from studies of HRRs which, because of aggregation, obfuscate its true magnitude. Rather than recommending practice incentives to take on risk, the report should have recommended social interventions that could reduce risk. By coincidence, that is what President Obama did at Knox College in Galesburg Illinois the very same day. He said, “this growing inequality — it’s not just morally wrong; it’s bad economics… and it undermines the very essence of America.” He could have added, and it raises health care costs. Moreover, because poverty is distributed unevenly, it is responsible for the geographic differences in health care that we had been told were due to clinical practice variation but now know are due to geographic differences in income-inequality. In a new paper in Medical Care Research and Review, Reschovsky, Hadley and Romano have shown quite conclusively that geographic variation in health care spending is related to the burden of illness and little else. Of course, the burden of illness is greatest among the poor, and the two are strongly correlated, so, indirectly, they also showed that geographic variation is related to poverty and little else. Their study examined health care spending in 60 regions that have been studied for many years by the Center for Health Systems Change, shown below. The graph below summarizes the data. Medicare expenditures varied widely, as had been observed in studies using the Dartmouth Atlas. Dartmouth’s earlier studies (not shown) corrected for age, gender and black race but nothing more, believing that there was no need to correct for illness levels because the expenditures that Dartmouth studied were in the last two years of life, and since everyone was similarly dead, they all must have been similarly ill, a conclusion which, aside from being absurd, has been shown to be false, most completely in the Reschovsky study. Sutherland and coworkers from Dartmouth approached the question by studying patients in the Medicare Current Beneficiary Survey. After the standard adjustment for demographic factors, they adjusted the data using five disease parameters and found that such as adjustment explained 18% of the variation between the extremes of expenditure quintiles. Zuckerman and colleagues carried out an identical study but applied 12 disease parameters, and they explained 29% of the variation. Reschovsky et al utilized 70 disease parameters within the hierarchical condition category (HCC) model developed for the Centers for Medicaid and Medicare Services (CMS) and found that illness levels explained 93% of the variation. Even using a modified version to remove observer bias in charting illness, disease burden accounted for 85% of the variation. Isn’t it time to stop this foolishness about geographic variation being a manifestation of variation in practice? Wouldn’t it have been wonderful if that could have occurred before all of the foolish incentives and penalties were written into Obama-care? Shouldn’t someone be held accountable for deceiving congress, distorting the practice of medicine and bilking the profession? Isn’t it time that the high health care costs of poverty became a focus of national attention? Don’t we owe our children a health care system that they can sustain? Won’t it take honest, critical research (like Reschovsky’s) to get us there? More War on Waste: Do Hospitals Profit from Complications? Gawande has struck again, concluding in his recent JAMA article that “some hospitals have the potential for adverse near-term financial consequences for decreasing post-surgical complications” (aka, they’ll make more profit if they let complications happen). In a follow-up article entitled “Hospital Profits Linked to Patients with Surgical Complications,” the Huffington Post rephrased it this way: “Patients who suffer complications after surgery are lucrative for hospitals.” How grotesque. And in an accompanying editorial, Reinhardt, the economist who trumpeted the “physician surplus” 15 years ago when that was popular, quickly added that the fault may be the fee-for-service payment system that rewards volume rather than quality, today’s bandwagon. And everyone has jumped on the band wagon. But remember McAllen? Everyone jumped on that, too. It took a while to figure out that the McAllen story was poppycock. First, what were these complications? More than half were MIs, cardiac arrests, pneumonias or strokes. Another 15% were use of a ventilator for more than 96 hours, which is never preventable (one wishes it could be). Only 10% were wound-related (a total incidence of 0.5%). None were events that physicians or hospitals want. The remarkable thing is how few of the complications were avoidable. How do you prevent a stroke? Nonetheless, the implication was that hospitals and their doctors egregiously and selfishly tolerate errors to increase profits and that the fee-for-service system enables such behavior. Once again, the public has been poorly informed. So how did hospitals profit from all of this? Please bear with me because the numbers in the article are a little complicated. I will try to simplify them. For uncomplicated patients, who length of stay averaged 3 days, the margin earned by hospitals, after paying for variable costs (nurses, medications, etc. ), was a little over $2,500 per day, a total of $7,600 for a 3-day admission. Complicated patients stayed an extra 11 days, and although the margin for them was less (about $750 per day), the extra 11 days yielded an extra $8,100. That is what led Gawande et al to claim that hospitals make more. An extra $8,100 per admission. The problem is that hospitals don’t run on variable costs alone. There are fixed costs, like buildings, maintenance, equipment, administrative staff, etc. In the Gawande study, these were $2,200 per day. When these were also considered, uncomplicated patients produced a net profit of $300 per day for 3 days, yielding a total profit of $1,000 per admission. Complicated patients produced a loss of $765 per day for 11 days, or $8,400, which was offset by a surplus of $1,000 from the first 3 days to yield a net loss of $7,400 per admission. How do complications make money for hospitals if complicated patients are a loss? Gawande’s answer is that the hospitals aren’t full anyway, so the fixed costs are there with nobody to pay for them, and whatever extra revenue can be derived from complications is simply gravy, even if it’s less than the revenue from uncomplicated patients. The implication is that hospitals encourage or at least permit complications to keep their beds full and earn an extra $750 per day. But how do they promote MIs or pneumonia, and do they really keep people on ventilators needlessly for more than 96 hours? Unfortunately, no one will look at the details. They didn’t in McAllen, either. JAMAs editors must nor have looked at the details, either. Yes, as the events in Boston vividly showed, they are admirable. They are professionals. They deal with patients who will assuredly have complications that no one wants nor can avoid, least of all the physicians who are caring for them and the hospitals in which they are receiving care. Physician shortages are being disproportionately felt in primary care, as fewer physicians practice office-based primary care and as more NPs and PAs work in specialty practices. Who will provide direst access care, how will they be trained and what will they be able to do? The Academic Consortium for Alternative and Complementary Health Care has published a report on the current and prospective roles of doctors of chiropractic, naturopathic physicians, doctors and practitioners of acupuncture and Oriental medicine and direct-entry midwives in meeting nation’s primary care needs. In aggregate, there are about 100,000 practitioners in these fields (see below), most in chiropractic. This new report, “Meeting the Nations Primary Care Needs,” offers an opportunity to learn what these professions are doing and to assess the extent to which they could participate in meeting some of the unmet needs in primary care. It is the best compendium of thoughtful analysis on these disciplines that currently exists. Are the authors correct? Is this a way to meet the nation’s needs? Comments from readers of this blog will be welcomed! Critical Access Hospitals: The Canary in the Mine for Specialist Shortages? 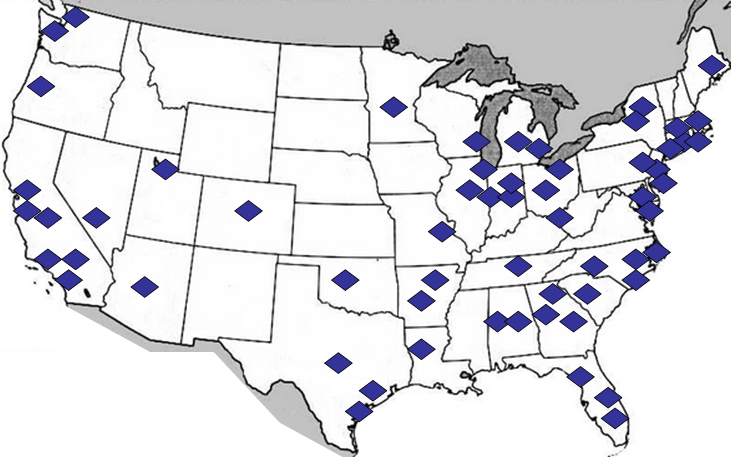 An article in the April 3rd issue of JAMA describes the higher mortality from acute MI, congestive health failure and pneumonia in critical access hospitals (CAHs) (small hospitals in sparsely populated areas). The authors reasoned that the difference was due to the fact that most hospitals have quality reporting programs but CAHs do not. But CAHs lack another important ingredient: specialists. While the counties with and without CAHs had similar numbers of generalist physicians (about 50 per 100,000), counties with CAHs averaged only 14 specialists per 100,000 while other counties averaged 100 specialists per 100,000, a seven-fold difference. Over the period of observation (2002-2010), mortality improved in some CAHs but not in others. There was no difference in the average numbers of generalists in the counties where improvement occurred vs. where it did not, but the number of specialists was 30% greater in the counties where mortality in CAHs improved. There was a lot of variability in the data, so the statistics are not strong. But we know that the evolving specialist shortage hits remote areas first. Are CAHs showing us what happens when there aren’t enough specialists? Could CAHs be the canary in mine?